Komplett umgestalten, nur wenige Schritte von der Fashion Square Mall und Minuten zu allem! Lage, Lage, Lage! Schöne Remodel mit sauberer, moderner Einrichtung mit allem ausgestattet, was Sie brauchen, um dies zu einem wahren Zuhause in der Altstadt von Scottsdale zu machen. High-End-Ausstattung, hochwertige Bettwäsche, Fernseher in beiden Zimmern, Kabel, kostenloses WLAN, Klimaanlage und vieles mehr. Voller Zugang zu mehreren Pools, Shuffleboard, Grill und Waschküche. Gehen, radeln, fahren oder fahren Sie zu allem, was Scottsdale großartig macht! Great location in central Scottsdale! Ric was a very responsive and friendly host. His condo was safe, comfy and clean. We didn't use the pool area, but it looked like a nice place to hangout for an afternoon. 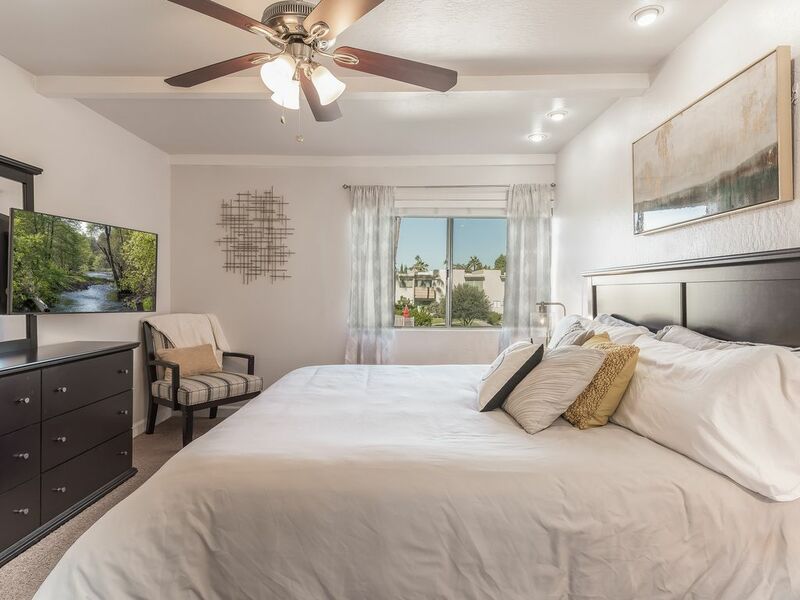 The best thing about this VRBO is that the location is very close to old town Scottsdale and the Fashion Square mall. The mall is basically a two block walk and old town is about 1/2 mile away. Thanks Ric. Beautiful condo, where special attention was clearly made to provide all you need when traveling. 😊� Owner made sure our needs were met and communicated well. Would recommend to anyone traveling to this area! Really enjoyed our short stay...able to walk most places. Would recommend and stay again! It was quiet, clean, accessible, and friendly neighbors!! 15 minute walk to fashion square to catch the Trolley for the Giant gameswas nice rather than trying to find parking. Was a pleasure hosting your stay Terry. Please come again! The location was great. Old Town Scottsdale. Beautiful area and great weather in January. The property is old, but, clean and well maintained. A safe neighborhood. The unit was a fair value for the area. Thr bed was very comfortable. Owner was very responsive if we needed anything.The only nuisance was that while the appliances appeared to be new, they were very LOUD. Dishwasher, refrigerator, at times made it difficult to hear the TV. Loudest dishwasher ever! Also, the heat when it came on at night was very noisy. Thank you so much for the feedback. The heating systems is very rarely used and does take some extra time to get up to temperature when used and can be a bit noisy if run at night. Hadn’t heard that the dishwasher noise was an issue but we’ll certainly address that in the near future. Thank you again.